Preston North End dazzled at Deepdale as they saw off high-flying Norwich City in style on Wednesday night. Ben Davies, Paul Gallagher and Sean Maguire got the goals as the Lilywhites hit top form. It’s nothing new but confidence really is everything in football. The first half on Wednesday night some of the best football Deepdale has seen in a long time from their team. Alex Neil’s side went into the game five unbeaten and it showed. The Lilywhites harried and hustled as is becoming their trademark and then when the chance arose broke at pace and knocked the ball around with eye-catching ease. There were flicks here and tricks there as the Championship leaders were pulled apart. It was breathless stuff from a team that is only going to get better given the age of the key men involved. The night was summed up late on in the second half with a mazy run down the left from Lukas Nmecha that should have resulted in a goal for Brad Potts. What Neil has at his disposal, particularly with Sean Maguire at the point of his attack, is the fluid frontline he has always talked about as being his preference. Setting up in a 4-1-4-1 system, the players had clear starting positions but they interchanged liked they’d been doing it for years. If one pressed another one dropped in and if Maguire found himself out on the wing Brad Potts or Alan Browne would happily move inside. Tom Barkhuizen’s pace on either side or over the top was a real threat with Norwich not knowing whether they were coming or going in the first half. This was very much a performance of two halves as after playing some scintillating stuff in the first half North End were made to work, especially in the third quarter of the game. Norwich came out flying at the start of the second half and showed for a spell why they topped the pile at the start of the night. But having entertained in the first 45 minutes PNE stuck to their defensive task well when they were right up against it. They were disciplined behind the ball with key blocks and key saves coming in when needed. Only one mix-up involving Ben Davies really threatened to derail that. Declan Rudd’s season has been far from straightforward. An error against Birmingham going viral on social media in a difficult start to the campaign seemingly put his position under real scrutiny. But his comeback has been impressive to say the least and is a real testament to the ‘keeper’s character. He marked his 100th league appearance for PNE in style against his former club. An early save from Teemu Pukki gave a demonstration of the kind of form he was in and then came his big moment late in the half, Rudd diving low to his right to keep out Marco Stiepermann’s spot kick. Excellent in its own right, that is a third penalty save of the season from a man who then produced some vital saves in the second half before Sean Maguire got a crucial third goal for PNE. There was just one thing missing from Sean Maguire’s encouraging return from injury, a goal. He got that on Wednesday night, converting a rebound after Alan Browne’s stunning strike from distance had cannoned back off the woodwork. It was a far from straightforward finish, Maguire taking a touch on his chest before firing home left-footed from 15 yards. 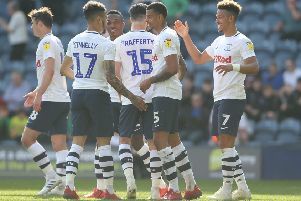 It was his first of an injury-hit campaign and came at such an important moment in the context of the game, PNE having been right up against it. To top things off, Maguire even made reference to his well-groomed eyebrows that went viral on social media last week with a cheeky celebration.